Revision Facelift Revision Face lift expert Dr. Andrew Jacono discusses revision face lifting techniques and procedures. 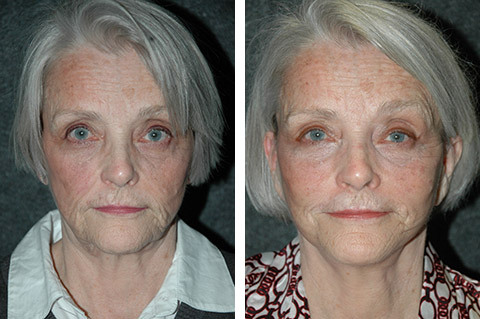 Revision facelifts or secondary facelifts are procedures done after a person has already had a facelift. 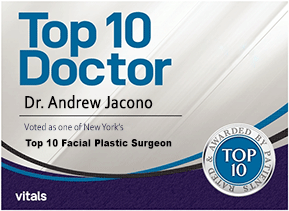 Doctor Jacono specializes in revision facelift surgery and corrective face lift surgery. Doctor has been at the forefront of developing procedures to best address patients who have previously undergone facelift procedures. Patients who consult Doctor Jacono for revision facelift procedures have significantly different needs than the patients who have not had prior facial rejuvenation surgery. 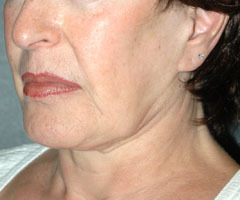 As a result, a revision or corrective facelift requires special techniques and care because of previous surgical manipulations. 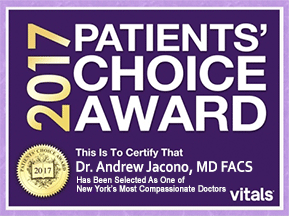 Doctor Jacono uses a customized approach that deals with the unique issues that each patient has when seeking revision facelift surgery. There are many reasons people seek revision facelifts. The most common scenario is the person has had a successful facelift which has naturally aged over time and now it is time to repeat it to maintain your youthful appearance. Most times well performed face lifts last over 10 years. 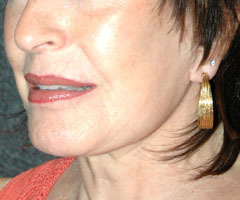 Other times a person has had a facelift and the result was not acceptable because areas of the face were under treated. The most common problems include continued jowls or neck laxity after surgery, or drooping of the cheeks and mid facial area after a face lift. Procedures that do not last as long as anticipated are also a very common reason a person will inquire about a secondary facelift procedure. Patients who are overdone with a tight or stretched appearance tend to be dissatisfied and also seek corrective facelift revision procedures. Any facelift technique that places excessive tightness on the skin can produce scarring and distortions around the ears (pixie ear deformity)or hair line problems (loss of sideburns). Revision Facelift Patient 1: Revision Facelift Patient after having a skin only face lift with superficial muscle tightening with sutures done elsewhere by another doctor. Notice that after her first face lift she had sweeping of the skin called a lateral sweep deformity, residual jowling and neck drooping and drooping cheeks. She also has a “pixie ear: or pulled down ear. Doctor Jacono performed a revision deep plane face lift that tightened the deep musculature of the face, and lifted the drooping tissues. Many patients who have undergone previous lifting procedures have thinner skin and require special treatment to avoid having complications from secondary procedures. After the skin has been thoroughly evaluated, the facial balance between the upper, middle, lower and neck regions of the face must all be detailed. The areas of imbalance can be addressed at the same time with an endoscopic brow lift, midface lift or blepharoplasty procedures. Also, we now know that the aging process is not just a matter of gravitational laxity, but that significant volume atrophy is also due to the change to the skeletal bone as well as subcutaneous fat atrophy. As a result many patients undertaking secondary facial procedures will require multilevel fat transfer and grafting to restore facial volume. 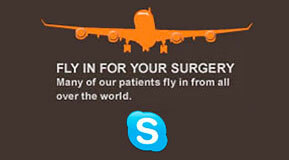 Superficial based facelifts are the most common type of face lift performed by approximately 90 % of plastic surgeons. They only tighten the skin and do not lift the supportive musculature of the face (the SMAS muscle in the cheek and Platysma muscle in the neck), but simply put tightening stitches in the surface of these muscles (suspension sutures) that have a limited and short term effect. This ends up producing tight skin, poor scars, and ear distortions (called a pixie ear) but leave deeper tissue structures such as jowls, nasolabial folds and neck skin under treated. Results such as this can be very frustrating. Furthermore many doctors use liposuction under the neck and when combined with an inadequate superficial skin lift can result in a cobra neck deformity, with the center of the neck caved in and with hanging jowls on either side (shaped like a cobra’s head). Revision Facelift Lateral Sweep Deformity Patient 2: This patient had a facelift with another doctor that was not Dr Jacono. She had a lateral sweep deformity after her facelift which is caused by too much superficial tension on the skin and pulling the SMAS and skin laterally or toward the ears. 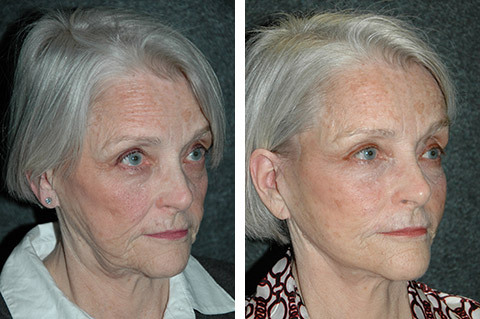 The facelift also did not lift the deeper muscles of the face and neck. 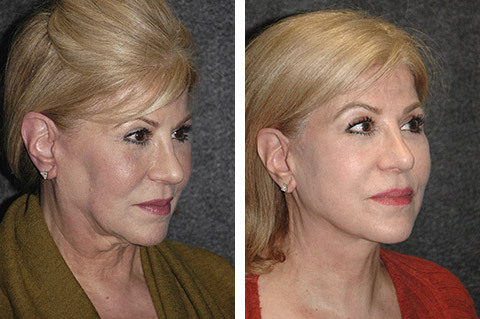 Doctor Jacono performed a revision facelift utilizing a deep plane technique to relieve the tension from the surface of the skin and lift the face vertically. The pull marks through the face are gone and the cheeks, jawline and neck are smoothed and residual drooping is corrected. Facelift Revision procedures must concentrate on the sagging deep tissue that has not been addressed by the original superficial facelift. In these cases a Deep Plane Facelifts indicated as it does not tighten the skin and is directed at the sagging deep tissue. It lifts under the SMAS and Platysma muscle described above, supports the face, lifts drooping, and takes the tightness off the skin. It is the best option for a second facelift without producing any further tightening of the skin layer, and it will correct residual jowling, heavy neck, and cheek drooping and nasolabial folds in one procedure. 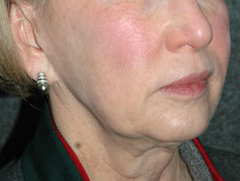 If the only problem is drooping cheeks but the jawline and neck were corrected by the first face lift, an endoscopic midface lift is indicated. The Endoscopic mid facelift is utilized by only a few surgeons around the world in facial cosmetic surgery and was developed by combining modern endoscopic techniques and craniofacial reconstruction. 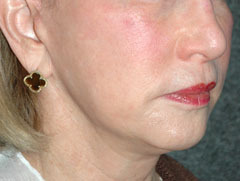 Using small incisions and a small telescope, the mid-face region is elevated and placed back in its original position. The eyelid-cheek regions as well as the nasolabial folds return to their natural youthful position providing significant harmony to the face. The drooping cheeks, hollowness under the eyes , and smile or “laugh lines” dramatically improve. Some people will complain about their scars but be satisfied with their facelift. 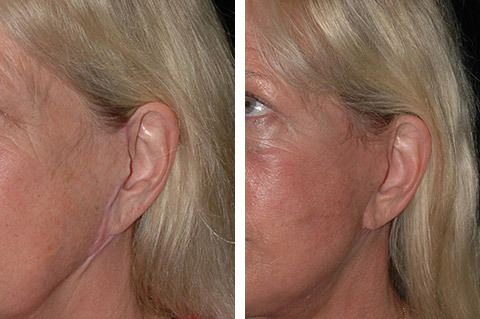 Bad scars are always the result of excessive skin tightness. Simply cutting and restitching the scars alone (scar revision) will produce greater tension on the new scar and cause a worse resultant scar and should be avoided. In these situations, revising the facelift with a lift that supports the muscles and the deep layer of the face will allow the old scars to be removed and take the tension off the skin so the new incision lines will heal without bad scars. 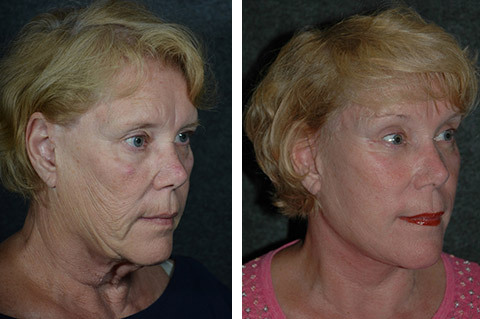 Revision Facelift Cobra Neck Deformity Patient 3: After having a facelift surgery with another surgeon, this female patient was left with a cobra neck deformity (residual neck bands with a central depression located under the chin). To correct this deformity, Dr Jacono performed a platysmaplasty and an extended lateral platysma flap during a deep plane to smooth out the neck contour and remove the cobra deformity. 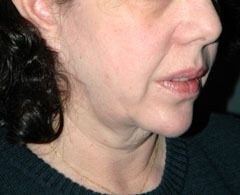 Her after photos show a smooth and wrinkle free neck with a well defined jawline. Revision Facelift Before and After Patient 4: This female patient came to see Dr. Jacono to address issues resulting from a previous facelift surgery with another surgeon. In her before photos, you can that she has residual jowling that was not corrected, and an unnatural hollow look to her cheeks. You can also see that she was left with a sagging lower jawline and a pinched neck. Dr. Jacono performed a revision deep plane facelift with fat grafting to the depressions in the cheeks. He also performed a platysmaplasty to contour the turkey neck left behind. After these deformities are corrected and you can see in the after photos that her cheeks look natural and her jawline looks flawless. 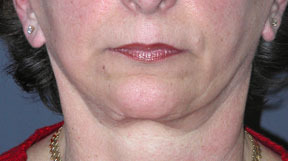 Revision Necklift and Jawline Before and After Patient 5: This female patient had a previous facelift proceudre with another surgeon. Unhappy with her results, she sought out Dr. Jacono to perform the revision surgery to correct her neck and jawline regions. 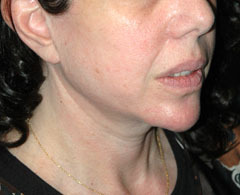 Her after photos show a smoother feminine jawline and a much improved neck. Revision Facelift Pixie Ear Deformity Patient 6: This female patient came to see Dr. Jacono to correct a pixie ear deformity and a very visible scar both of which were caused by a facelift she had with another surgeon. 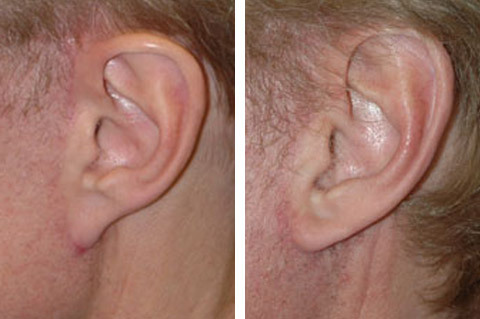 Her after photo shows a significant improvement to the pixie ear deformity and a much improved scar line. Revision Facelift Pixie Ear Deformity Patient 7: Revision Facelift Patient after having a skin only face lift with superficial muscle tightening with sutures done elsewhere by another doctor. Notice that he has a severe pixie ear deformity. The pixie ear is corrected after revision face lift. 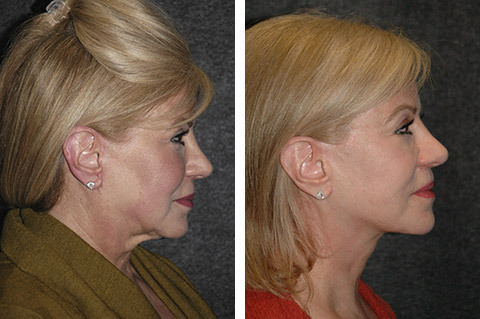 Revision Necklift & Facelift Before and After Patient 8 & Patient 9: Dr. Jacono performed a revision facelift and necklift on these patients to correct their drooping cheeks, jowls, and sagging neck bands. They both had SMAS lifts that tightened the muscles with stitches and needed more support of the deeper muscles of the face that was accomplished with a deep plane facelift. 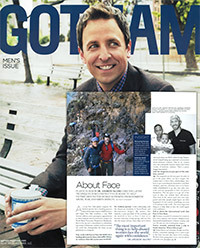 Their after photos reveal lifted cheeks, smooth lower jawlines, and no more sagging neck skin. 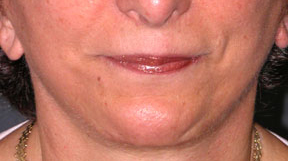 Revision Facelift Lateral Sweep Patient 10: This patient had a facelift procedure with another surgeon and as a result was left with loose droopy skin on her cheek and jaw areas. She has pull marks on the lateral part of her face creating a lateral sweep deformity. Her cheeks were extremely droopy as well. After a deep plane cheek lift her cheeks appear fuller without the addition of any fat injections or fillers, and the sagging skin is smoothed. Her lateral sweep deformity is corrected as well as her jowls and wrinkled neck region. Revision Facelift Cobra Neck Deformity Patient 14: Revision Facelift Patient after having a skin only face lift with superficial muscle tightening with sutures, and submental liposuction done elsewhere by another doctor. The cobra neck deformity was corrected by revision facelift and platysmaplasty. Revision Facelift Patient 12: Revision Facelift Patient after having a skin only face lift with superficial muscle tightening with sutures done elsewhere by another doctor. Notice that after her first face lift she had sweeping of the skin called a lateral sweep deformity, and a flat face with residual drooping of the cheeks and jowls. Doctor Jacono performed a revision deep plane face lift that tightened the deep musculature of the face, and lifted the drooping tissues. The pixie ear is significantly improved. 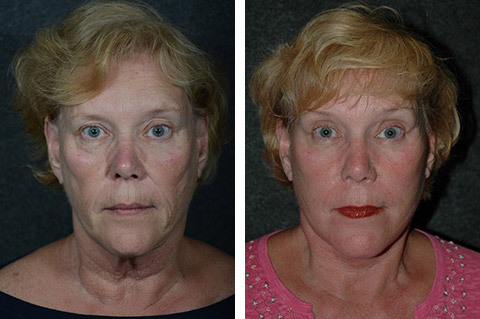 Revision Facelift Before and After Patient 13: This patient had a revision facelift procedure with Dr. Jacono to correct deformities caused by a previous facelift surgery performed by another surgeon. You can see that her previous face lift she was left with a lateral sweep deformity, drooping cheeks, jowls, and saggy neck. The after photos show her cheeks have been lifted and her jawline and neck region look stunning. Revision Facelift Patient 11: Revision Facelift Patient after having a skin only face lift with superficial muscle tightening with sutures done elsewhere by another doctor. Notice that after her first face lift she has a flat face with residual drooping of the cheeks and jowls. She also has a “pixie ear: or pulled down ear. Doctor Jacono performed a revision deep plane face lift that tightened the deep musculature of the face, and lifted the drooping tissues. Adding volume back to the cheeks. The pixie ear is significantly improved. Revision Facelift Patient 15: Revision Facelift Patient after having a skin only face lift with superficial muscle tightening with sutures done elsewhere by another doctor. Notice that after her first face lift she had sweeping of the skin called a lateral sweep deformity, a cobra neck deformity, residual jowling and neck drooping and drooping cheeks. She also has a “pixie ear: or pulled down ear. Doctor Jacono performed a revision deep plane face lift that tightened the deep musculature of the face, and lifted the drooping tissues, added volume back to the cheeks, and he fixed the pixie ear deformity. The cobra neck deformity is reversed.